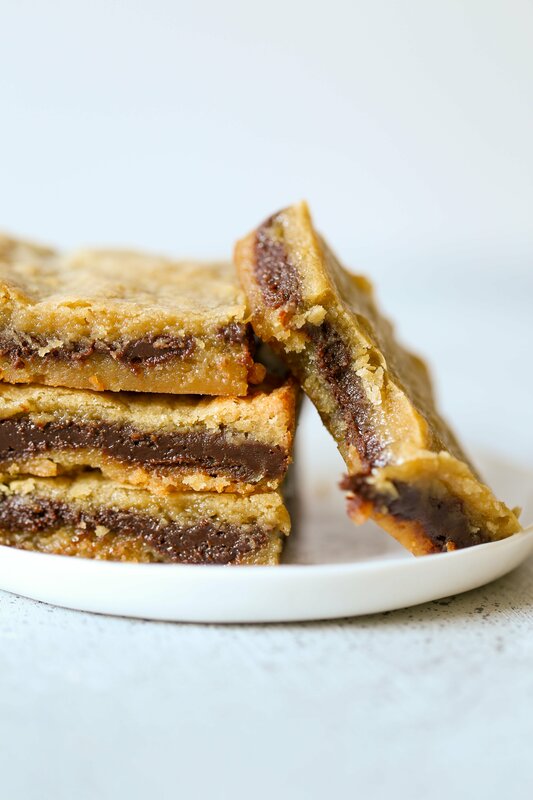 Fudge Stuffed Blondies are insanely rich and gooey with a hidden layer of easy chocolate fudge inside every bite! Simple 35 minute recipe. Download my FREE Cookie Customization Guide here! Taste: Sweet, chocolaty, and buttery. What more could you want?! Texture: Insanely chewy and fudgy! Ease: Placing the fudge layer in between the blondie batter is a little awkward, but luckily it doesn’t have to be perfect. Pros: Fun twist on a simple dessert. You could also cut them up into smaller pieces to feed a crowd. Would I make this again? Yes, definitely. I‘ve been meaning to share this recipe with you since last year. I actually feel bad for holding out on you so long, because the textures of this recipe are next level deliciousness. That’s actually the reason it took so long for me to finally be able to publish these Fudge Stuffed Blondies! The first batch of photos didn’t capture the intensely fudgy texture quite well enough. 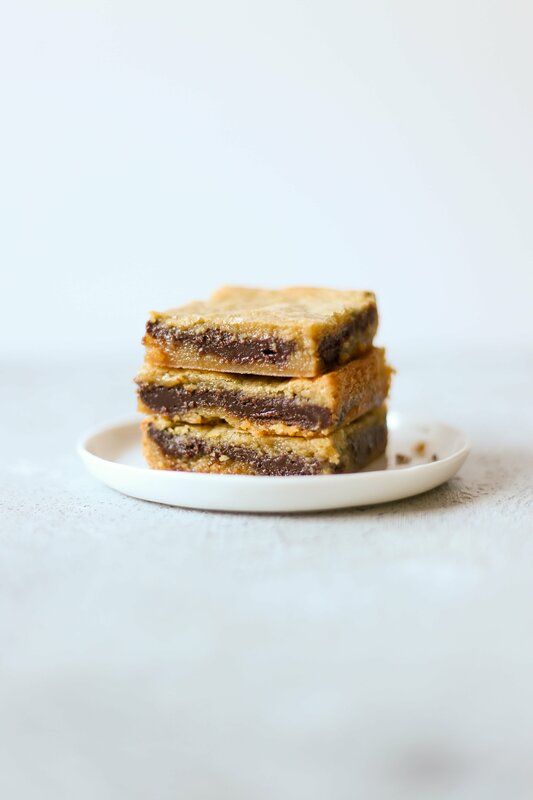 And after making a few batches of these blondies while developing the recipe and while photographing, I just couldn’t have them in the house anymore. They’re TOO dangerous. So I waited a few months. Then the other day I felt a jolt of inspiration and immediately got into the kitchen to make these blondies. Finally, I think I was able to capture the texture. Can’t you just imagine what taking a bite would feel and taste like?! I hope you make these soon. They’re super easy to whip up. While placing the fudge filling onto the first layer of blondie batter, I like to take portions of the fudge, flatten it out slightly in my hands, then place it down to make a relatively even layer. Luckily it’ll all bake out into a dream, whether the layers were perfect or not. If you do make this Fudge Stuffed Blondies recipe, be sure to snap a picture and share it on Instagram with #handletheheat. Preheat the oven to 350°F. Line an 8 by 8-inch pan with foil. Spray with nonstick cooking spray. In a small saucepan set over low heat combine the condensed milk, chocolate chips, and butter. Heat, stirring often, until melted and smooth. Let cool. In a large bowl stir together the butter and sugar. Stir in the egg and vanilla until smooth. Add in the salt and flour and stir until just combined. Pour half of the batter into the bottom of the prepared pan. Scoop and flatten the fudge mixture evenly over the dough. It doesn’t have to be perfect. Pour the remaining batter over the fudge evenly to cover completely. Bake for 25 minutes, or until lightly golden on the outside but still fudgy and moist on the inside. It’s better to under-bake than over-bake here! Let cool completely before cutting. Loved them. Taste kind of like a chocolate chip cookie. Doubled the recipe for 9 by 13 and it worked out great, Maybe just a little thick on the fudge.